Oklahoma City was hit hard again. Has anyone asked Oklahoma Senator Inhofe about the three large storms in the [past] 14 years? Nye openly discussed the importance of investigating climate change as the recent tornado system developed across Oklahoma. In an interview with CNN’s Piers Morgan, Nye said that tornadoes were driven by heat, which increases the chances of more dangerous storms. “You’ve got to figure that if there’s more heat driving the storm then there’s going to be more tornadoes,” Nye told Morgan. There are only a few scientific issues with Nye’s claim. Back in October 2012 the Met office in the UK which is one of the key proponents of the Climate Change hoax said global warming stopped over 15 years ago. That is that the average temperature between 1997 and August 2012 did not rise at all (there have other reports since echoing that claim). To put this no warming period in perspective, before 1980 temperatures were stable or even declining. Scientists were predicting another ice age. That was followed by a period of warming from 1980-1996. Now the world-wide temperatures have stabilized for as long a period as the warming which, when looked at objectively may mean the warming period was simply an aberration. number of tornadoes and tornado fatalities. Logic would dictate if warming cause the Oklahoma storms the entire season would be full of violent tornado activity. Of course there is also what we pointed out yesterday that back in the mid 70s scientists were claiming that global cooling caused the heavy tornado activity. 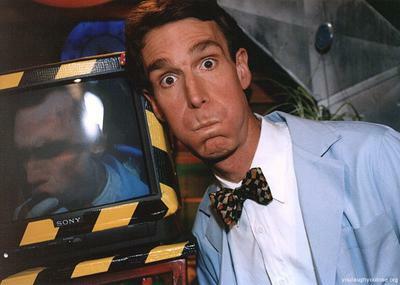 So in the end Bill Nye the Weather Idiot Guy is a hypocrite just like most global warming moonbats. Every time there is a series of blizzards or an extra-cold winter they rush to remind people that there is a difference between weather and climate, but the first time there are horrible storms such as Hurricane Sandy or this week in Oklahoma City they rush to say its climate change not weather. Nye should be rushing to raise money to help the victims of this weeks tornadoes but instead he is rushing to make a claim the storm was created by climate change which ignores science. Perhaps is Bow Tie is on a bit too tight.